Not too long ago I told you we got a bottle of stout beer as a gift from one of our graduate students. It turns out Chuck didn’t just give us one bottle, but three. My stud husband insisted on drinking one of them (the nerve! ), so I was left with only two for my cooking adventures. Clearly, I endure a lot to keep our marriage happy. 😉 Having made a chocolate cake with the first bottle, I wanted to switch gears and use the other in a savory recipe. 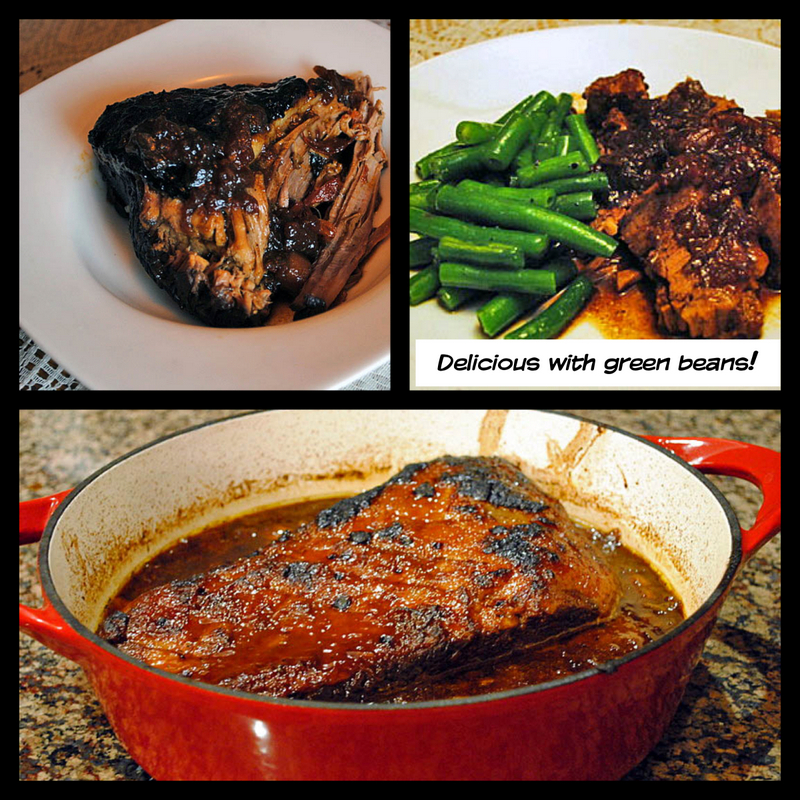 After a quick search on my scary-long list of “to make soon” recipes, I found exactly what I was hoping for: a brisket with a bourbon glaze, and a stout-based braising liquid. Irresistible. Mix all ingredients for the rub in a small bowl, and rub the brisket all over with it. Cover and place in the refrigerator from 2 hours to overnight. Remove to room temperature 1 hour before you start cooking. Heat the oven to 325 F. Heat 1 tablespoon of grapeseed oil on a large, oven-proof pot until very hot. Add the brisket, fat side down, and cook undisturbed for about 6 minutes, until golden brown. Turn the meat over and cook for 4 to 5 more minutes. Remove the meat to a plate and tent lightly with aluminum foil. Reduce heat to medium and add remaining 1 tablespoon oil. Add shallots and garlic. Cook, stirring occasionally for about 5 minutes. Add water, beef broth and all remaining ingredients. Bring liquid to a simmer. Return brisket to pot. Cover and transfer to oven. Braise until brisket is very tender to the touch but still holds its shape, about 4 and a half hours. Using a large spatula, transfer brisket, fat side up, to a large plate. Strain the braising liquid into a large bowl. Return liquid to pot, bring to a simmer, and cook until reduced to 2 cups, about 15 minutes. Score fat side of brisket by cutting a crosshatch pattern. Return brisket, fat side up, to pot with reduced braising liquid. Make the glaze by transferring 1/4 cup of the braising liquid to a blender, and pureeing with the apricot preserves and the bourbon. Season with salt and pepper. Preheat broiler. Spread 3–4 tablespoons glaze on top of brisket with a silicone brush. Broil brisket in pot until browned and glazed, watching carefully to prevent burning, 4–5 minutes. Transfer brisket to a cutting board. Slice against the grain and transfer to a large platter. Ladle braising liquid over. Drizzle remaining glaze on top, if desired. Comments: You can braise the meat until it is still firm enough to serve in slices as indicated in the recipe, or allow it to go a little longer in the oven until it starts to fall apart. Full disclosure: I intended to follow recipe as originally written, but someone invited me to go to Home Depot to get just a couple of things we needed around the house. The detour was longer than I anticipated, and by the time we got home, the brisket had passed the point of “sliceability”. 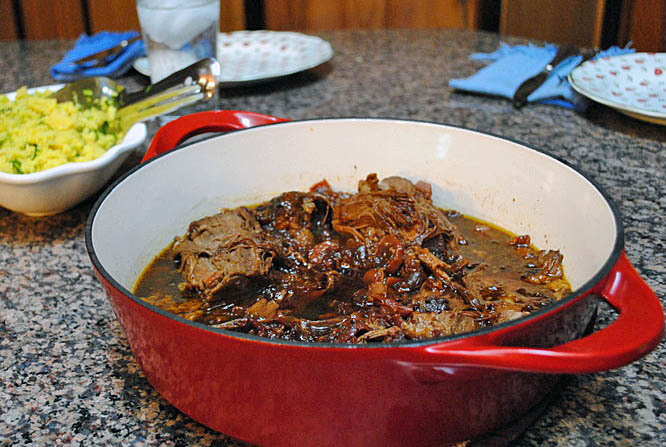 We didn’t mind at all, meat that shreds into the braising sauce is hard to beat. Leftovers were absolutely amazing. I cooked some noodles for the second time around, and used the braising liquid as my pasta sauce. I salivate as I type this and remember the deliciousness of that meal. Another great use for leftovers would be a moussaka type dish, as this one made last month by Celia. The season for long braises is pretty much over, so this was a fantastic recipe to wrap the month of March.